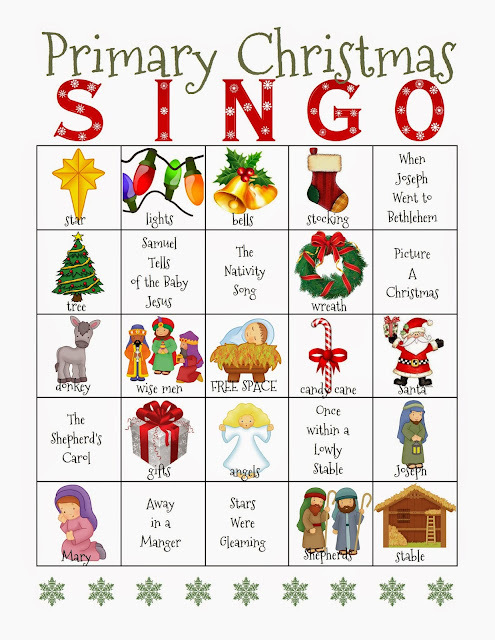 It's time for the annual Christmas Singo...this is such a great "holiday mode" activity for me, the chorister! Since I did the work years ago, I just pull it out of my files and head off to church! Love it! Find details HERE. I'd also like to wish everyone a very Merry Christmas and a Happy New Year!! I appreciate everyone who stops to comment, either here or on FB. It makes the effort of posting very rewarding and I'm so happy that I've been able to help those in somewhat of a daunting calling. I remember my first week as Music Leader and it was an epic fail! I went into the calling thinking I knew what I was doing. I spent all week creating a huge lesson plan and it flopped. Needless to say I was eventually led to the Internet for anyone willing to help a poor lost chorister! And I found a wonderful Michigan woman's blog (which is no longer available) who emailed me TONS of material! She was an answer to my prayer. Several years later, I now find myself in her spot being able to pay it forward and I love it! If you have thoughts of how I can better help you, please let me know! I've also recently been called as our Stake's Primary Music Leader and I'm excited to be working directly with the Music Leaders in my stake (don't worry...I BEGGED to still keep my singing time calling!). So this following year, watch for information I gather as I try to fulfill this new responsibility as well. The first stake music training I attended had some fabulous information. I took away ideas that I still use today! I'll be seeing you all next year when we delve right into 2016's songs!! Thanks for all you help. I have no imagination and your information gives me the boost I need. All of your ideas I have used have worked wonderfully! Really thank you so much. I'm in a branch in Cambodia and you are blessing kids' lives way on this side of the world! Happy Holidays. I need to take a minute and let you know... you have been a godsend to me with this calling, of primary chorister. What an intimidating calling, but so very rewarding. This calling has been exactly what I need in my life as I have been going through a very difficult trial. It is one of the things that has brought joy to my life and also kept me busy with good things! Thank you, thank you for helping me fulfill this calling!! I hope that you have had a wonderful Christmas with your family, and Best Wishes for the coming year!! Camille you are my favorite primary song blogger. There is something about the way you do lessons that jives with my teaching style. You are also so clever and fun. Thank you for taking the time to share all the detail you do. I remember on my first day of being primary chorister I taught all three verses to a song..a long song. What was I thinking?!? Boy have I learned! It's great you share your expertise with us all. I just talked my primary pres into getting some handbells so I look forward to using all posts on that. I love your blog! Thank you for all that you do! I have been the primary music leader for three years now and have consistently turned to you for ideas. I think you are amazing, and I tell everyone when they compliment me on a singing time - it's not my idea, it's Camille's! I can not thank you enough for all you do to put this blog together. Thank you for sharing your talents in so many ways. You will be such an asset to your Stake in your new calling. Thanks for your help. I am going to use the Christmas Singo for our Singing time the week before Christmas. I have used your ideas before. Such a help! Thanks for sharing!